Germany’s market was closed Monday for a holiday after stocks were higher Friday mostly from a positive report on GDP. On Friday Germany’s DAX Index finished the day at 9,952.90 for a gain of 90.78 points or 0.92 percent. Friday’s report on Germany’s gross domestic product showed a positive annualized rate of 2.7 percent with quarterly growth of 0.7 percent, just above the consensus of 0.6 percent. However, volatility in German stocks is likely to be high in the week ahead as uncertainty continues to remain around a U.K. exit from the European Union. Germany is one of the EU countries most reliant on the U.K. for trade and production activity. Stocks actively trading higher on Friday included E.ON AG, Merck, Continental AG and Deutsche Telekom. BASF and Bayer also continued to remain on watch as the two companies are rumored to be seeking buyouts of agricultural producer, Monsanto. Broadly in Europe, mining stocks were higher Monday as oil prices gained. In the U.K., mining stocks, Anglo American, BHP Billiton and BP led gains for the day. Anglo American closed at 609.58 GBX with a gain of 31.38 points or 5.43 percent. BHP Billiton closed at 851.16 GBX for a gain of 28.36 points or 3.45 percent. BP was higher by 2.49 points to close at 364.99 GBX for a gain of 0.69 percent. While Europe mostly gained Monday, volatility was high after the Empire State Manufacturing Index fell far below expectations at -9.02 versus consensus of 7.00 and economic data from China was disappointing. In China, industrial output increased by 6 percent, year-over-year in April, missing estimates of 6.6 percent and falling below the previous month’s reading of 6.8 percent. Retail sales in China were also lower than expectations with a year-over-year increase of 10.1 percent in April and down from 10.5 percent in March. In other European markets, France’s CAC 40 was down -7.71 points or -0.18 percent to close at 4,312.28. The Stoxx Europe 600 gained 0.05 points or 0.01 percent to close at 334.73. The Europe Dow was higher on Monday closing at 1,533.11 for a gain of 2.22 points or 0.15 percent. In Asia, stocks traded mostly lower. In China, the Shanghai Composite was higher by 23.75 points or 0.84 percent to close at 2,850.86. Hong Kong’s Hang Seng Index was higher by 164.66 points or 0.84 percent to close at 19,883.95. Japan’s Nikkei 225 gained 54.19 points or 0.33 percent to close at 16,466.40. The S&P BSE Sensex was higher by 163.66 points or 0.64 percent to close at 25,653.23 and India’s NSE Nifty was higher by 45.85 points or 0.59 percent to close at 7,860.75. As a broad market measure, the Asia Dow was higher by 2.92 points or 0.11 percent to close at 2,582.79. In the U.S., stocks traded mostly higher regaining some of last week’s losses despite the day’s data reports. For the day the Dow Jones Industrial Average closed at 17,710.71 for a gain of 175.39 points or 1.00 percent. 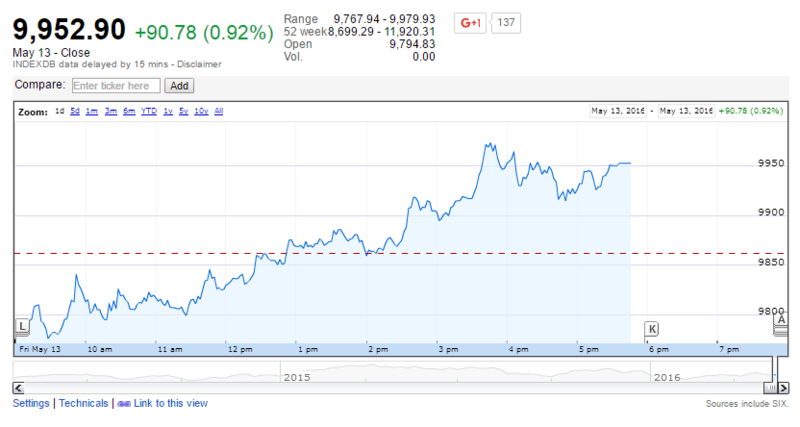 The S&P 500 closed at 2,066.66 for a gain of 20.05 points or 0.98 percent. The Nasdaq Composite was also higher at 4,775.46 for a gain of 57.78 points or 1.22 percent.